Store, access and transfer large files with ease when you use the compact SanDisk Ultra USB 3.0 Memory Stick.Rapid file transferMove hi-res photos, HD videos and other large files with surprising speeds of up to 80 MB/s thanks to the advanced capabilities of USB 3.0 technology.You'll spend less time waiting around as you move files between drive and computer as the Ultra offers transfer rates up to four times faster than USB 2.0 drives. Plus, it's USB 2.0 compatible, making it adaptable as well as fast.Store more with a high-capacity memory stickThe SanDisk Ultra is capable of holding 64 GB of data, so it's ideal for storing and transporting all your favourite media and most important documents.That includes everything from MP3s and presentations to hi-res photographs, films and graphics files, so it's great for everyone from musicians to businesspeople, photographers, designers and entertainment fiends.Keep those files privateThe inclusion of SanDisk SecureAccess software allows you to establish a password-protected folder on your drive for private use. 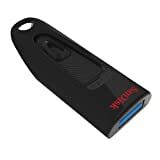 This protects your files with secure 128-bit AES encryption, helping them stay confidential even if you have to share the memory stick with others.Slickly mobile designSleek and finished in black, this SanDisk Ultra both looks great and is completely practical. It's so compact and portable you'll be able to fit it easily into a pocket or bag.Be assured of its superior quality with a five-year warranty.Choose the SanDisk Ultra USB 3.0 Memory Stick for premium portable data storage.